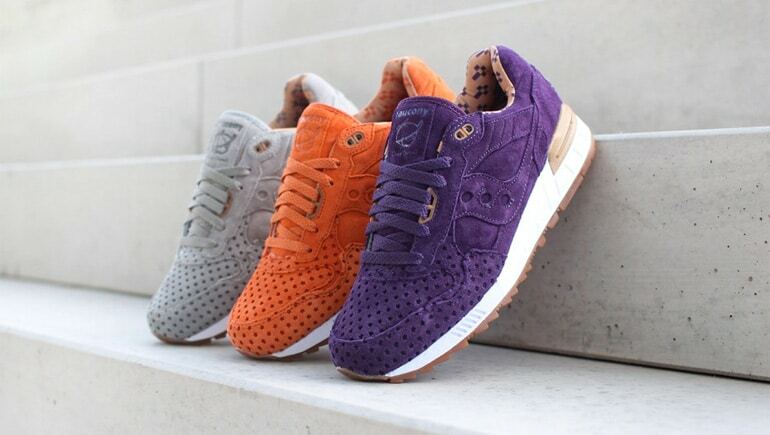 Saucony have gone wild with the collaborations this year. It feels like we’ve seen one per weekend over the last nine months, but the hit rate has been constant. We kept the faith for years, after we saw the Shadow 6000 back on the shelves in the UK (once upon a time we’re sure that the only place we ever spotted ’em was at ALIFE’s pioneering Rivington Club store). The Clipse-affiliated Play Cloths line has outgrown our initial assumption that it was BBC/BAPE-lite to keep on putting out some good Saucony dual-label pieces that have significantly more character than a lot of the limited takes on running shoes that we keep on seeing again, and again, and again. When we saw the ‘Strange Fruit’ name mentioned, we were afraid that it might be a reference to BIllie Holliday’s classic song (as sampled by Kanye) which would prove controversial , to say the least. Thankfully it’s literally themed on strange fruits and after doing precious metals and cotton candy on the Shadow 5000, these makeovers feel like a logical progression. Once again, it’s all about the star perforations and the quality of the suede is great (we spotted a couple of glue marks, but that seems to be commonplace on all-suede drops these days) and the gum soles and patterned linings make this concept work well. Being apple and orange types (or an avocado if we’re feeling fancy), we don’t know what strange fruits these are based on — is the purple a mangosteen and the orange a carambola? And what’s the grey taken from? The flesh from one of the former? We’re still oblivious, but those things you see in a worldly greengrocer that you don’t even know how to eat, make for great makeups on good shoes. These will be online this Saturday in limited numbers for 110 pounds a pair (and those oranges are particularly good).